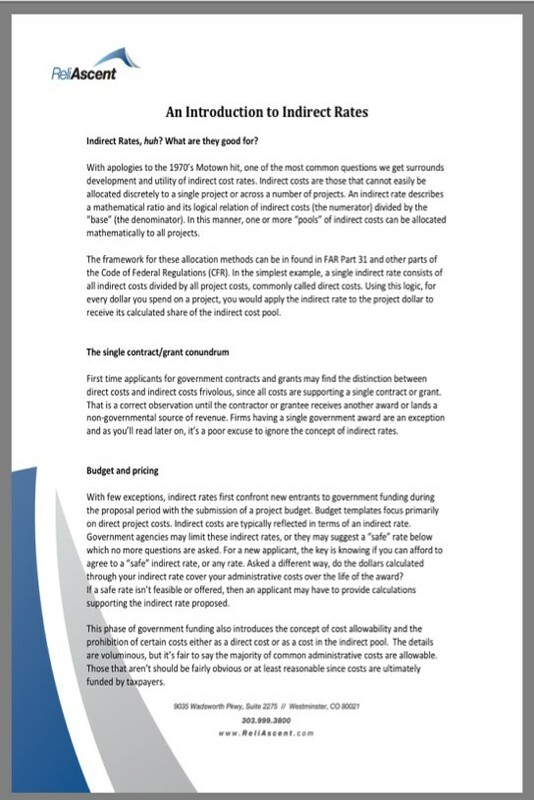 This white paper, written by ReliAscent AE Dave Donley, is the fourth in our monthly series on important Federal Government contract administration & management topics, and we encourage contractors to read and share these valuable resources among their colleagues. From managing your indirect rates, to accurately preparing a cost proposal, our series covers the contract management issues that impact every federal contractor's profitability and success; whether they know it or not! Get your copy of "An Introduction to Indirect Rates," now! We hope you find this white paper useful, and please feel free to contact us at any time, should you have questions about our government contract accounting, contract management, or outsourced CFO services for contractors.